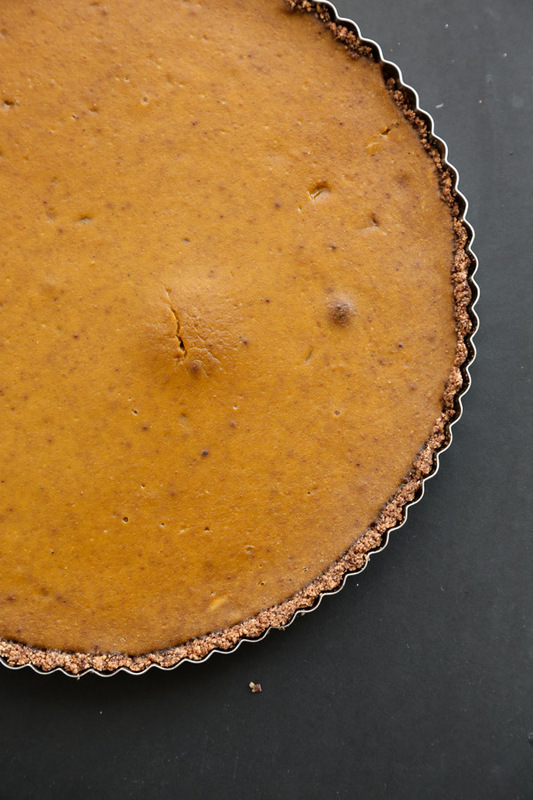 This gluten-free pumpkin tart recipe is sponsored by Whole Earth Sweetener Co. All opinions are my own (duh). Thank you for supporting the brands that make this site (and my low sugar dessert cravings) possible! I am a very sensitive person. And I’m not just talking about what becomes of my tear ducts during the first five minutes of any Pixar movie. 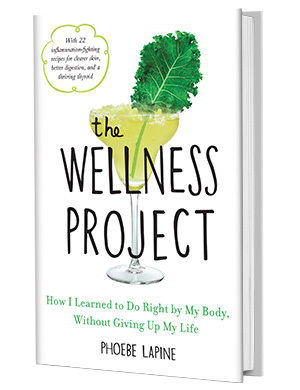 Since The Wellness Project, that statement now applies to many parts of my body. When I use shampoo at hotels, or dry my face with bleached, over-treated towels, my neck sometimes breaks out into a Woogie-level rash. A cup of strong coffee might cause my heart to drop a chest-shaking Tiesto remix. Even a small trace of gluten sends me into an early evening fetal position. 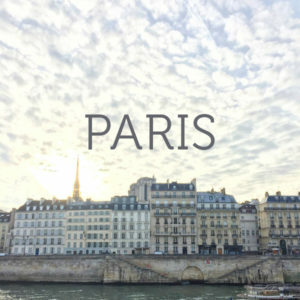 And if I don’t get enough sleep, or have a few cocktails with dinner, it makes even simple, mindless tasks like online shopping feel like I’m studying for the GRE (sizing charts can be complicated!). It took me a while to understand whether I was just more aware of these negative side effects, or whether my body had fully lost its tolerance for certain toxins. It’s probably a little bit of both, but especially come the holidays, when I want to embrace a little hedonism and throw caution to the wind, these constant morning-after reminders of my misguided choices makes me feel like I’ve been expelled from Eden. This, of course, also applies to sugar. My escapades with the Halloween candy bowl were yet another reminder that I am not the girl I once was. And not just because I forgot to put on my Marcia Clark costume. When I lose myself to a tray of chocolate, I get an immediate refined sugar hangover. For my birthday three years ago, friends created a gluten-free cake that was just a giant mound of sour gummy candy. Alas, now that I’m hitting 31, my delicate constitution can’t even handle a few neon worms. With the exception of the cane sugar I’m now using for my kombucha experiments (my pet scoby is going strong! ), I’ve switched to all natural sweeteners at home. Perhaps this has just increased my sensitivity to the likes of gummy watermelons outside the house. But I’ve found I can recreate just about any dessert using just these tools. Recently, I’ve started experimenting more with Stevia, a sugar substitute derived from plant leaves. When my mom used to put it in my tea when I was growing up, I found the top note a little soapy and hard to get past. But for whatever reason, the products have evolved since then, and especially in baked goods, you can’t tell the difference. 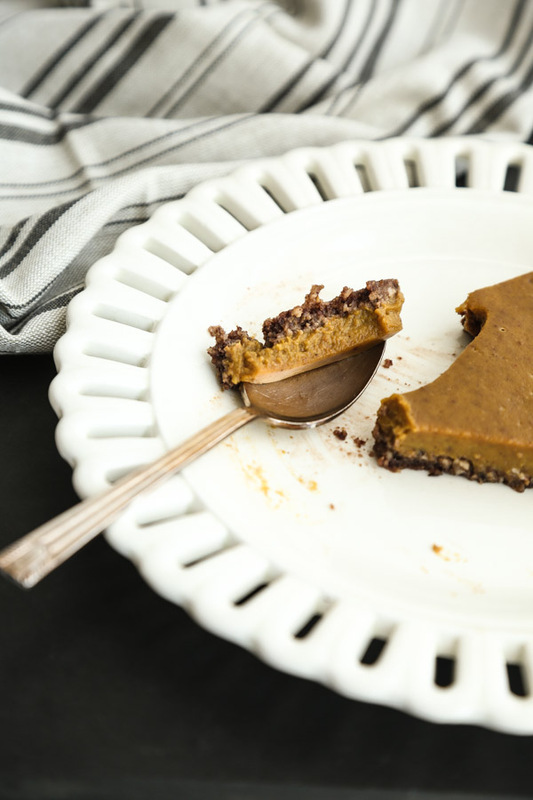 I created this gluten-free pumpkin tart filling using a nice healthy hedonist happy medium: non-GMO Whole Earth Sweetener Co. Honey 50. It’s a mix of honey and stevia, which means you can get away with using half the quantity for the same sweetness. 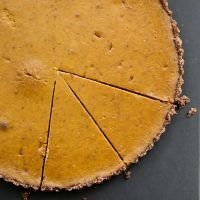 I love the flavor of honey with pumpkin, especially in this filling which is kicked up with extra cinnamon, a little cayenne, and cradled in a Mexican chocolate crust. I’ve made this vegan gluten-free tart crust using almond and hazelnut flour and both are delicious. (See here for other recent adventures in hazelnut flour). Since I added the cocoa in this version, I used some of the Whole Earth Turbinado Raw Cane 50 to offset some of the bitterness. Like the other products, you can swap this one for regular table sugar. Half the amount gives you the same amount of sweetness and 50% fewer calories. I’m not sure what I’m going to do for a birthday cake this week (we’ll see whether or not the 9th becomes a very happy day, or whether I’ll be moving to Canada), but this tart solves the next holiday on deck. 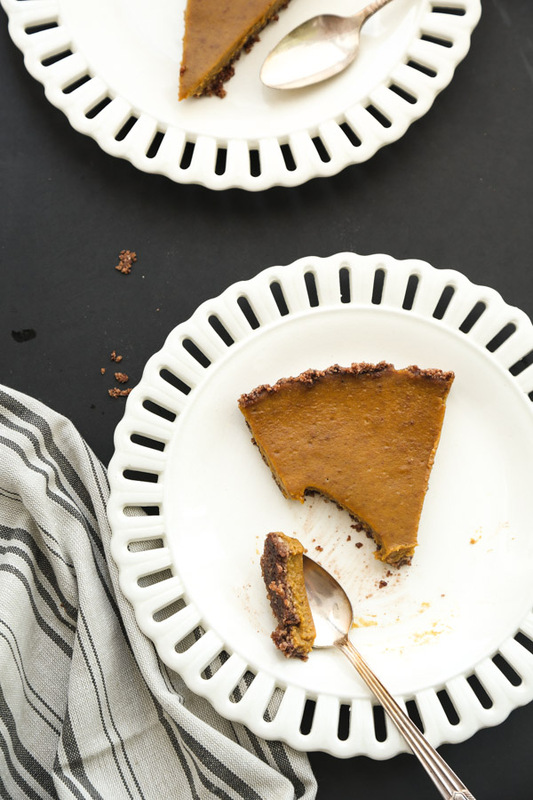 If you’re looking for a low sugar option for your Thanksgiving table, give this gluten-free pumpkin tart a try. Your head, heart and stomach will appreciate the break, and you can let your sensitivities loose on a little cartoon rat chef after the meal. 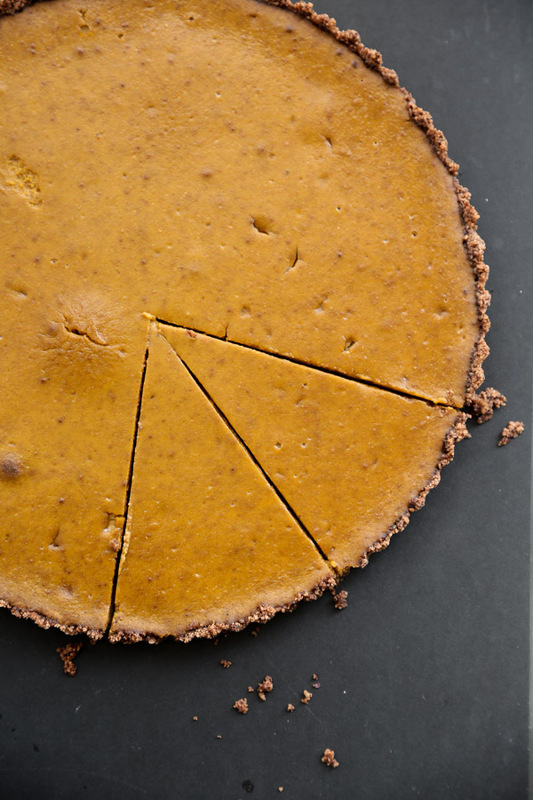 This gluten-free pumpkin tart recipe is kicked up with cayenne and cloves--a great compliment to the Mexican chocolate-almond crust. Preheat the oven to 350 degrees F. Line the bottom of a 9-inch tart pan with parchment paper. Grease the sides with oil. In a small food processor, pulse the almond or hazelnut flour, Whole Earth Sweetener Co.Turbinado Raw Cane 50, cocoa, cinnamon and salt until combined. Add the oil and pulse a few more times until crumbs form. 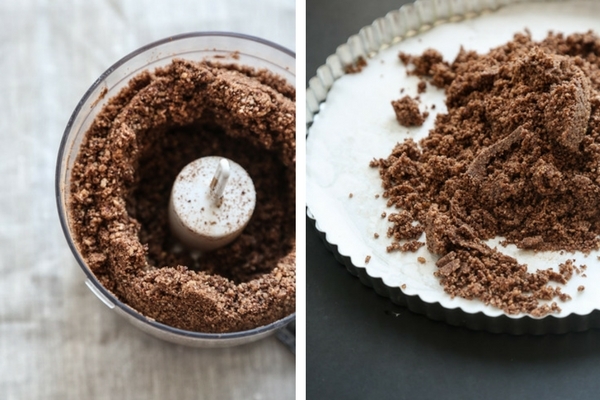 Transfer the crust to the center of the tart pan. Using a sheet of plastic wrap or greased palms, press the dough out into an even crust, coming just ¼ to ½ an inch up the sides. Transfer the tart pan to a baking sheet and bake in the oven for 8 to 10 minutes, until firm and beginning to brown. Remove and let cool. 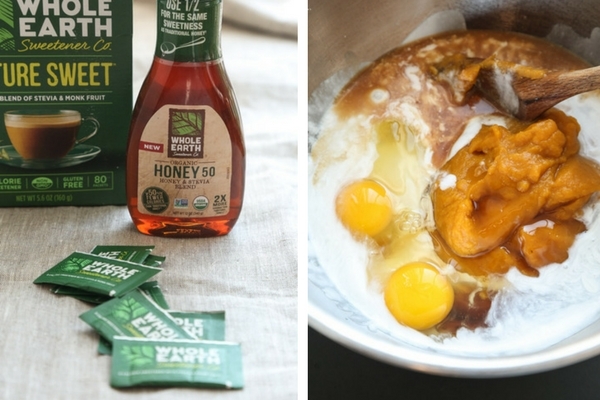 Meanwhile, in a mixing bowl, whisk together the pumpkin puree, eggs, coconut cream, Whole Earth Sweetener Co. Honey 50, cinnamon, nutmeg, ginger, salt and cayenne until smooth. Transfer to the tart shell and spread in an even layer. Return the tart to the oven and bake for 30 to 35 minutes, or until the top has set and is beginning to lightly brown. Cool in the pan until room temperature, at least 1 hour, before cutting into slices and serving. thanks Christina!!! little nervous to be doling out baking recipes to you, so you’ll have to let me know if you see improvements 🙂 BTW def try the Bob’s Red Mill Hazelnut flour if you haven’t. Such an amazing flavor. Loved the butteriness in this crust. Hi Phoebe! I am in a similar boat with food but can only have stevia for the time being. I would love to make this for thanksgiving but was wondering how you would sub the sweetener for all stevia/ liquid or powder. Thanks so much! can’t wait to try this!